Welcome back to our Authentic Man series, where we take a look at unique individuals from across the globe sharing their unique life experiences. On this installment we interviewed a loyal Lockhart's customer, Ricardo Garcia. Randy (Lockhart's): Hey Ricardo, first off I'd like to thank you for taking the time to do an interview with us today and sharing your story. Tell us a little about yourself, where are you from and what do you do for work? Ricardo: I am originally from San Jose, California, but I now live in Tennessee. I work at a company that makes various vehicle parts. Randy (Lockhart's): What provoked you to move away from your family in San Jose to Tennessee? Why did you choose Tennessee as your destination to move to? Ricardo: At home, I never really had any support from my family. People doubted my ability to succeed when I lived in San Jose, and that fueled me to want to prove them wrong and live out the successful life that I wanted to pursue. I was working two to three jobs at a time struggling to get by. I saw an opportunity for success out in Tennessee where I could live with my cousins until I get myself on my feet. I told my mother and step father that this was my aspiration and in three to four months I wanted to move out there when I had saved enough money. This was all just an idea until about a month later, one morning around 8AM my step father who was highly intoxicated sat down next to me while I was eating breakfast. He said that he was tired of me being around and that I was a disgrace. He also said that he was under the influence of cocaine. He then proceeded to get up screaming "I'm going to kill you!". He grabbed a kitchen knife and chased after me so I locked myself in my room. He kept stabbing holes in my door while yelling at me that he was going to kill me. He went around our house to the window in my room so I took that opportunity to run out of the house and escape. I was running down the street with no shirt or shoes while he kept chasing me telling me to come back and that he would kill me. After this happened I was crying, trying to explain what had happened to my aunt, uncle and cousin over the phone. They didn't believe me; they took his side of the story over mine. The next day I took what money I had and bought a plane ticket to Tennessee and moved away to my cousins place. After this incident, my family called me back realizing the truth of what happened to me, but their concerns weren't genuine. They did not care that I was almost killed by my step father, they just wanted something to gossip about. Randy (Lockhart's): Wow, that is insane that you made it through all that and were able to follow your dream to move to Tennessee. Were you and your mother close? How did she react to the incident with you and your step father as well as you moving away? Ricardo: My mother and I were close. When she heard about what had happened, she was in shock. My step father was not a mean person, but when he was under the influence of drugs and alcohol, he was a totally different person. She did not want me to move away, but I had to convince her that for my safety that it was best for me to relocate. She relocated in California as well to stay safe, and now she supports my decision. Randy (Lockhart's): Are you still in contact with any of your other family since your move? Ricardo: For a short time I was. They supported my move and stopped doubting my ability. Then all conversations had to be about negative things, despite all the positive change in my life. They tried telling people that I was lying when I was saying how good things were when I moved, so I had to cut ties to make my life more positive. Randy (Lockhart's): Was there a big improvement in your quality of life after you moved away? Ricardo: Absolutely. When I moved to Tennessee I was accepted by my cousins there with open arms. It took me about six months after moving and having a stable job to move out and have a place of my own. I still have my job and I'm very glad that I made the move. Randy (Lockhart's): Do you have any hobbies outside of work or anything in particular you enjoy doing since you've moved? Ricardo: I really enjoy hiking and experiencing the outdoors. Tennessee has a lot of great trails to hike and a lot of awesome scenery. I also love boxing as well. Randy (Lockhart's): Do you have any advice to anyone who is thinking about moving away who is in a similar situation you were in while living in California? Ricardo: The key is to stay positive. You can't let negativity rule you when wanting to make a big decision like that. You just have to push on. Things will get better eventually, you just have to make the right choice for you. Randy (Lockhart's): How did you end up discovering Lockhart's pomade? What is your favorite Lockhart's product? Ricardo: When I first started using pomades, I had tried four or five other brands, but those just weren't working for me. I then stumbled upon some reviews online of how great this brand of pomade called Lockhart's is. If it was one or two reviews, it probably wouldn't have pushed me to try it, but good things about Lockhart's just kept popping up. So I looked up a couple videos on YouTube and then I wanted to try some product for myself. Let me say, I love the Lockhart's pomades, there is truly nothing else like it on the market. 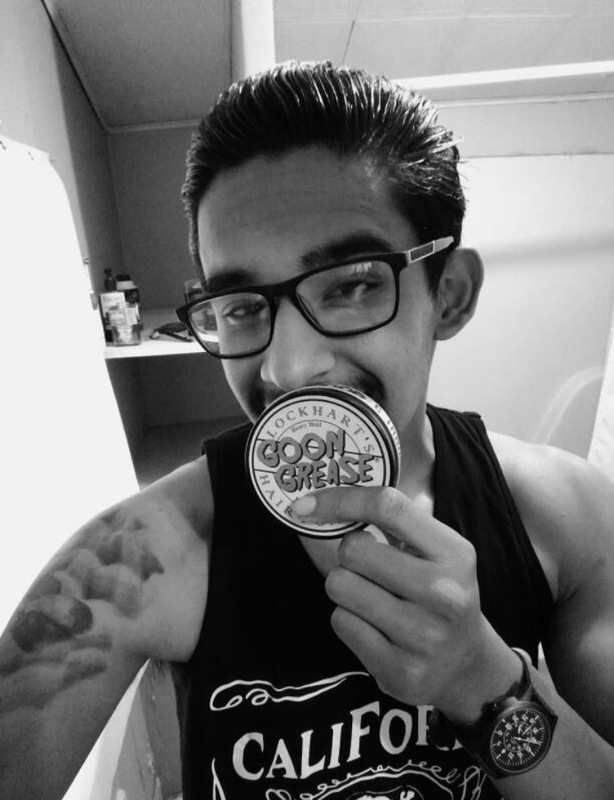 My favorite product is Goon Grease, and I use it as my day to day product. This concludes today's Authentic Man interview. I would really like to thank Ricardo again for taking the time out of his day to sit down and share his story with me. Feel free to give Ricardo a follow on instagram @ricard0_1994. Stay tuned for more stories as we find more authentic men to share their stories and inspiration.